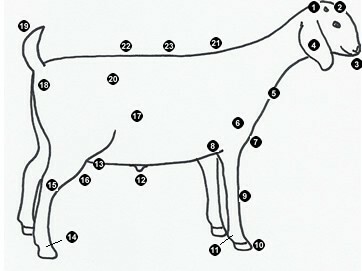 From the rear, the hindquarter should be muscular, and showing good width down its top. Thay should have a deep, heavily muscled leg and rump, with the widest part of the leg being the stifle area. They should have a broad, thick top and loin that in naturally firm and hard handing. Stature: The term stature refers to the overall skeletal size and length of the goat. They need to have an adequate length of cannon bone from knee to pastern and above average in overall length of body and general size. The cannon bone length is a good indication of skeletal size. The goats height measured at the withers should be slightly more than at the hips, the bones should be of good size. Rump: The goats rump should be long, wide and level from the stifle to stifle cleaning fleshed and have a slight slope from hips to pins. The shape of the rump is important as it affects leg set. Condition: The term condition refers to the amount of finish or fat the animal is carrying. Goats deposit fat internally before they do externally. The ideal condition is a thin, but uniform, covering over the loin, rib and shoulder. The external fat thickness over the loin at the 13th rib should be between .08 to .12 inches or an average .1 inch. Acknowledgements: Much of the information used for this criteria was taken from Texas Agricultural Extension Service publication B-5018.